Facts about Sussex chicken. The Sussex Chicken's name came from the place of its origin, the country of Sussex. The Sussex chicken are tagged as the most favorite table birds (for their meat) about 100 years ago. However, it still holds its identity as one of the most popular breeds to keep and raise. 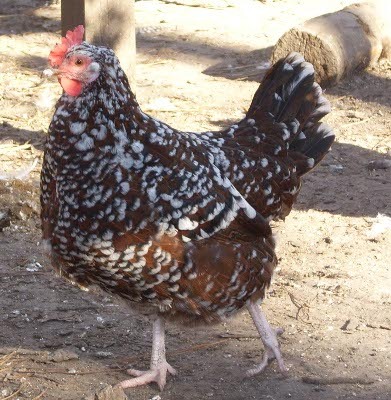 The original color of the Sussex Chicken was speckled, red and brown. It is grown as a dual purpose breed and is famous as one of the most productive breeds today. The female Sussex chicken can lay around 260 eggs in a year. The eggs are large and are a cream to brown in color. The Sussex chicken breed has successfully made its way across hundreds of years and has enlisted itself in the list of oldest chicken breeds. The Sussex Chicken seems to stay alerted all the time, but shows quiet nature (docile). They are adaptive to all kinds of soils and weather conditions. They are also very good foragers. The Sussex chicken tend to flee when freed but can flourish in a closed space. The Sussex chicken don’t brood very often, which is a rare case seen in chickens. The speckled variety is the one that goes broody the least. The eyes of the Sussex chicken breed are red in the darker ones and orange in the lighter ones. The Sussex chicken usually have a single comb of medium size. The common features between all varieties include the red earlobes and white legs and skin. Among all the colors mentioned above, the brown and red ones are rare, so they are very difficult to find. However, the other varieties are quite common in the market. The Sussex Chickens lay tinted or light brown eggs. They tend to lay eggs on the coldest days of the winter. The Sussex chicken may show a tendency to fly, but become unable to do so when they mature due to their fatty bodies, so can be restricted to an area with low height fencing. The "speckled" variety has a unique plumage which acts as camouflage from predators. The average size of Sussex chicken is 7 to 8 pounds (3.2 to 3.6 kg).